After yesterday's drought, we have six new polls today. 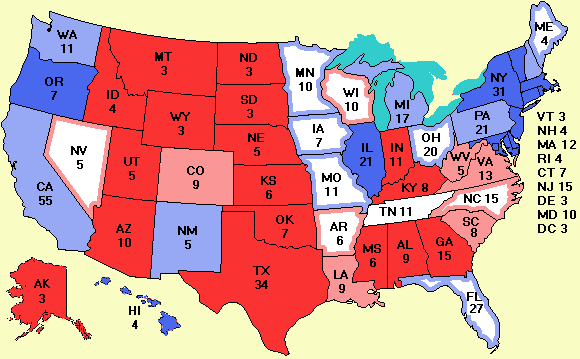 The results in Arizona, Indiana, Iowa, and Minnesota are similar to the previous polls. However, Wisconsin has flipped and is now favoring Bush by 1%, with Nader at 4% there. No wonder that Republicans are helping Nader get on the ballot in some states. However, a little-noted factor that may also play a role in some key states is the Libertarian Party, whose candidate, Michael Badnarik, is polling around 1% in the Midwest. The core belief of the Libertarian Party is small government. It favors low taxes but also believes the government has no business telling consenting adults what they can and cannot do in private. This puts its views on gay marriage, abortion, and other divisive social issues in stark contrast to George Bush's views. Its support is coming almost entirely from disgruntled Republicans who like Bush's stand on taxes but dislike his approach to social issues. As we saw in Florida last time, sometimes 1% matters a lot. Today's final poll was in North Carolina. It is slightly more recent than the Gallup poll we had up yesterday and done by a different pollster (Mason-Dixon). Unlike the Gallup poll, which had Bush 15% ahead, this one shows North Carolina to be a statistical tie. A couple of demographic tidbits from this poll are interesting. Whites favor Bush 59% to 35% but blacks favor Kerry 84% to 6% with the rest for other candidates or undecided. Among North Carolina men, it is Bush by 53% to 39% but among women, it is Kerry by 51% to 43%. Talk about an Edwards factor. The ladies of North Carolina are clearly in love with him.